Nothing puts a damper on all the hard work and lawn care you’ve done like brown patches of grass on your, otherwise, lush green lawn. This is especially frustrating and alarming if you are unsure of how they got there. 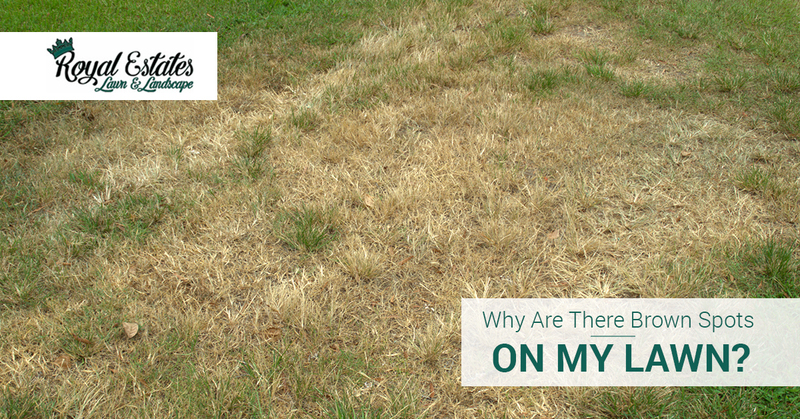 If you fall into this category and this is how you wound up on this blog post, Royal Estates Lawn & Landscape would like to share with you some information regarding brown patches and how you can prevent them. If you are in the Ascension Parish area and are looking for expert landscapers and lawn care providers who can handle all of your lawn services — like mulching, pruning, lawn mowing, landscape maintenance, and more — give us a call at 225-303-3782 to learn more and to get your free estimate. Fungal outbreaks are quite common. Generally, these occur following an extremely rainy or humid weather pattern. The moisture, lack of sunlight, and poor air circulation encourage the development of fungus, which causes irregular-shaped brown patches on your lawn. In mid to late summer, grubs are a common lawn problem. These nuisances feed on the roots of grass, causing it to turn brown, sponge-like, and disconnected. Grubs are most easily identified when your grass pulls back from the ground effortlessly, like a loose carpet. Additionally, if you pull back your sod and see white, curved worms, it’s time to get some grub control products. Believe it or not, this is one of the most common culprits for brown spots. Animal urine, especially dog urine, is rich in nitrogen and when mixed with grass, it can cause the grass to turn yellow or brown with a dark green outer ring. When you leave toys like trampolines, inflatable pools, and slides on the grass for too long, you can expect to experience the consequences. These objects smother grass and deprive it of sunlight. Leaving a toy on the grass for a single sunny day is enough to cause damage. When the growing conditions of your lawn are not favorable to growth, you can expect to see some brown patches. There can be a number of variables that contribute to poor growing conditions. These include poor soil, erosion, buried debris, drought, dormancy, root competition, and more. Additionally, when weeds like crabgrass and foxtail begin to die, they can leave behind dead brown spots on your lawn. Also, improper lawn mowing, meaning mowing with dull blades or mowing too low can also contribute to brown, dry-looking grass. Where Can I Find An Ascension Parish Lawn Care Company? Contact Royal Estates Lawn & Landscape! From lawn mowing to mulching to pruning, we can handle virtually all of your lawn and landscaping needs. Contact us today to learn more or to schedule your free estimate.